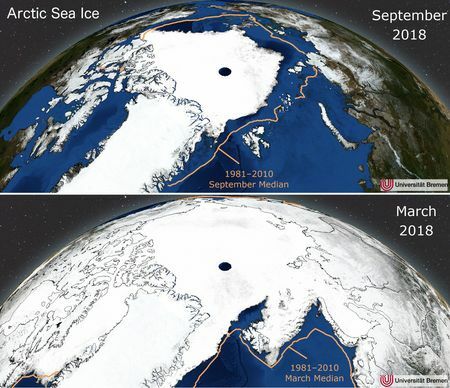 Credits: Sea ice concentration calculated at the University of Bremen from 89 GHz data of the AMSR2 sensor on the GCOM-W1 satellite; background: "Blue Marble” MODIS data from the NASA Earth Observatory; 1981-2010 sea ice contour from NSIDC: National Snow and Ice Data Center. The extent of sea ice in the Arctic shows a strong seasonal cycle: in March the sea ice area reaches its largest and in September its smalles extent. During recent years the sea ice extent has reduced significantly compared to the long-term median of the 20 years 1981 to 2010. 2018 minimum sea-ice area from AMSR2 compared to historic summer ice extents: In red the 30-year September median for 1981-2010 and in orange the lowest minimum in 2012. 2017 minimum sea-ice area from AMSR2 compared to historic summer ice extents: In red the 30-year September median for 1981-2010 and in orange the lowest minimum in 2012. 2016 minimum sea-ice area from AMSR2 compared to historic summer ice extents: In red the 30 year September mean for 1981-2010 and in orange the lowest minimum in 2012. The 2016 minimum was the second lowest on record. 2015 minimum sea-ice area from AMSR2 compared to historic summer ice extents: In orange the 30-year September mean for 1981-2010, in cyan the lowest minimum in 2012 and in red the 2007 minimum. 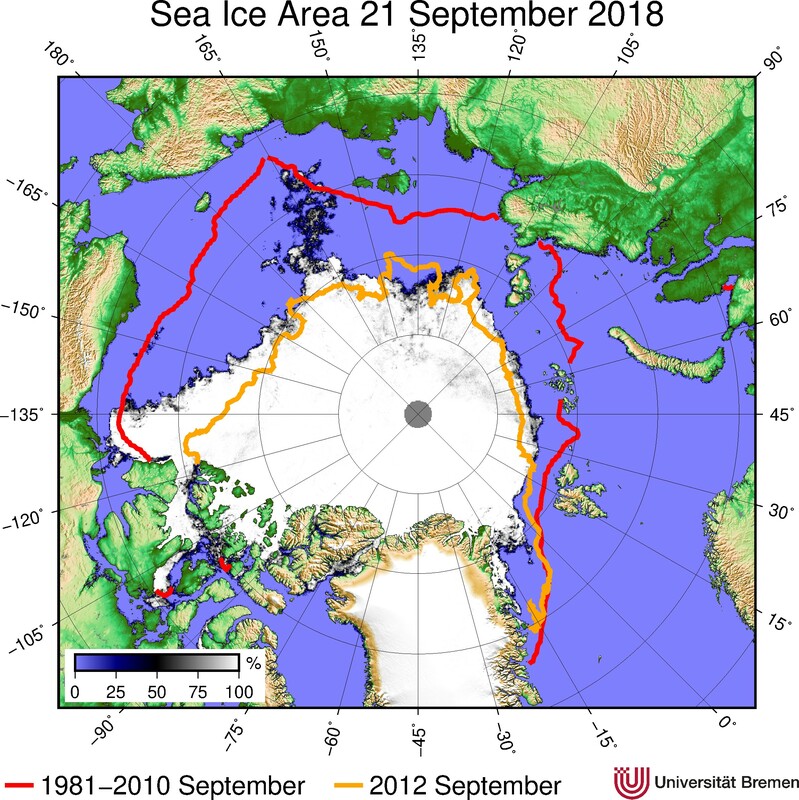 2012 minimum sea-ice area from SSMIS, the lowest sea-ice extent on record, in comparison to September 2007 (red) and September 1979-1983 (orange) sea-ice extents. 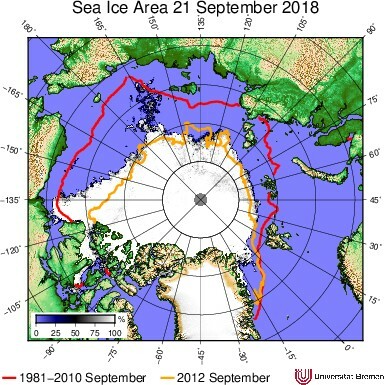 2011 minimum sea-ice area from AMSR-E in comparison to September 2007 (red) and September 1979-1983 (orange) sea-ice extents. 2010 minimum sea-ice area from AMSR-E in comparison to September 2007 (red) and September 1979-1983 (green) sea-ice extents. 2009 minimum sea-ice area from AMSR-E in comparison to previous sea-ice extents. 2008 minimum sea-ice area from AMSR-E in comparison to previous sea-ice extents. 2007 minimum sea-ice area from AMSR-E, the lowest sea-ice extent on record at that time, in comparison to previous sea-ice extents. 2006 minimum sea-ice area from AMSR-E in comparison to previous sea-ice extents. 2005 minimum sea-ice area from AMSR-E, the lowest sea-ice extent on record at that time, in comparison to previous sea-ice extents.